Akerly & Childs carries all popular Clevite Rod and Main Bearings. This includes the “P” Series bearings for street applications, plus high performance “H” and “V” series. 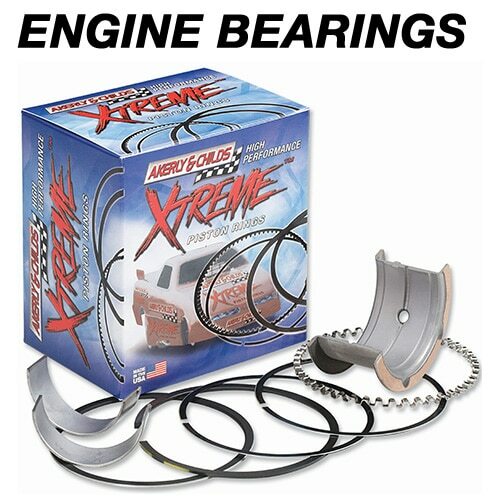 We also have a selection of King Engine Bearings in many of the popular engine brands and sizes. We stock the King “HP” Bi-metal Rod and main bearings as a substitute to the discontinued Clevite “M” Bearings used in the early 392 Chrysler, Big Block and Big Block Chevy engines. Kings “XP” Bearings are also a great substitute for Clevite “H” Bearing, as they maintain precise tolerances. Have a bearing question? Call Akerly & Childs super helpful Tech Department and we’ll be happy to answer any questions concerning your bearing requirements.